Posted by Barry Templeton on Wednesday, February 27, 2013 in News. WASHINGTON — NASA has selected 24 small satellites to fly as auxiliary payloads aboard rockets planned to launch in 2014, 2015 and 2016. The proposed CubeSats come from universities across the country, a Florida high school, several non-profit organizations and NASA field centers. 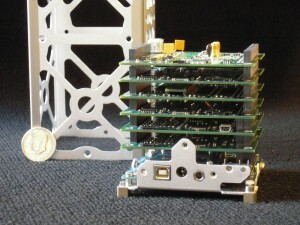 CubeSats belong to a class of research spacecraft called nanosatellites. The cube-shaped satellites measure about 4 inches on each side, have a volume of about 1 quart, and weigh less than 3 pounds. — The Aerospace Corporation, El Segundo, Calif.
— The Discovery Museum and Planetarium, Bridgeport, Conn.
— Embry-Riddle Aeronautical University, Prescott, Ariz.
— Pennsylvania State University, in partnership with the Naval Research Laboratory, Monterey, Calif., and the Aerospace Corporation, El Segundo, Calif.
— Vanderbilt University, Nashville, Tenn., in partnership with the Radio Amateur Satellite Corporation, Silver Spring, Md.